LIU Yang-qing, LIU Xiao-qing, YU Yi-xin. 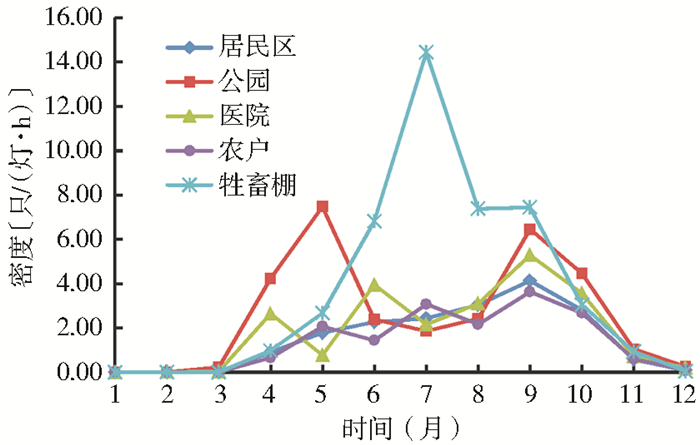 Investigation on the biting midges in different habitats in Nanchang, China, 2009-2012[J]. Chin J Vector Biol & Control, 2018, 29(3): 267-270. Abstract: Objective In order to determine the diversity, distribution and seasonal dynamics of biting midges in different habitats of Nanchang city, China. Methods Biting midges were collected using a UV light traps with a suction fan, monthly collections were made during 2009-2012. Trapping was carried out twice a month (one was in the first ten-days of a month and the another was in the last ten-days of the month, and there were at least 15 days apart) from sunset to sunrise the following day throughout the study periods. Results A total of 63 874 biting midges were collected in 2009-2012. 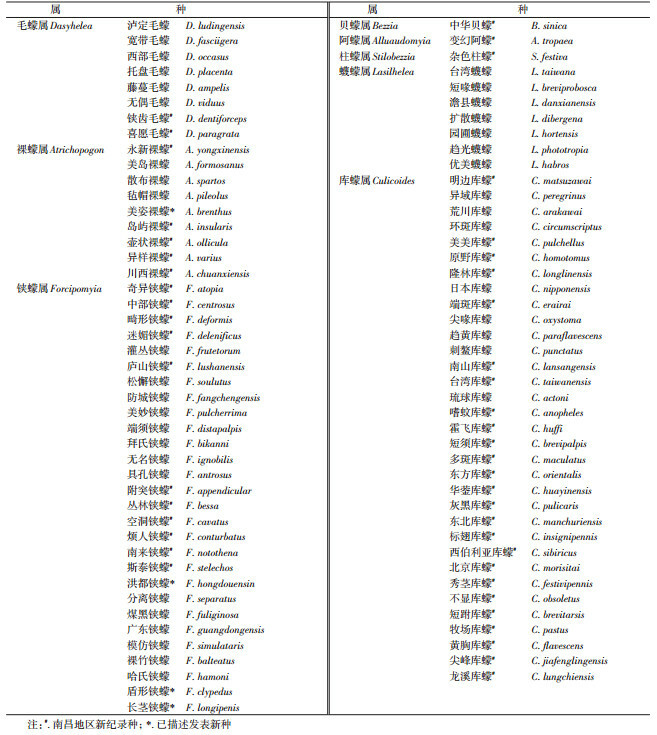 Eight genera (Dasyhelea, Atrichopogon, Forcipomyia, Lasiohelea, Culicoides, Alluaudomyia, Stilobezzia, and Bezzia)including 88 species were identified. Dasyhelea was the main genus in residential area 's habitats (36.07%)and hospital habitats (43.50%); Forcipomyia and Dasyhelea were the predominant genera in park habitats, comprised 34.04% and 31.92%, respectively. Culicoides was the predominant genera in residential area's habitats and animal shelters, comprised of 49.14% and 86.35%, respectively. Culicoides and Lasiohelea were the main blood sucking biting midges in Nanchang city, and they comprised 41.79% of the total number of collections. There were two stationary active seasons, peaking in July and September, in a year. Biting midges were recorded from March to November in 2009 to 2012. Conclusion Biting midges are abundant and widespread in human and livestock living environments, and the transmission risk of Culicoides-borne viruses exists. 虞以新. 中国蠓科昆虫[M]. 北京: 军事医学科学出版社, 2006: 1-9, 39-1610, 1669-1671, 1682-1683. Chen HY, Liu YQ, Yu YX. Two new biting midges of the subfamily Forcipomyiinae Lenz(Diptera:Ceratopogonidae)from China[J]. Zootaxa, 2012, 3582: 33-36. 刘仰青, 陈海婴, 虞以新. 江西省南昌市铗蠓亚属一新种描述(双翅目:蠓科)[J]. 中国媒介生物学及控制杂志, 2013, 24(1): 60-61. Liu YQ, Chen HY, Yu YX. Description of two new species in the genus Forcipomyia(Diptera:Ceratopogonidae) from China[J]. Entomotaxonomia, 2017, 39(1): 76-81. 刘仰青, 陈海婴, 柳小青, 等. 南昌市梅岭风景区蠓类调查[J]. 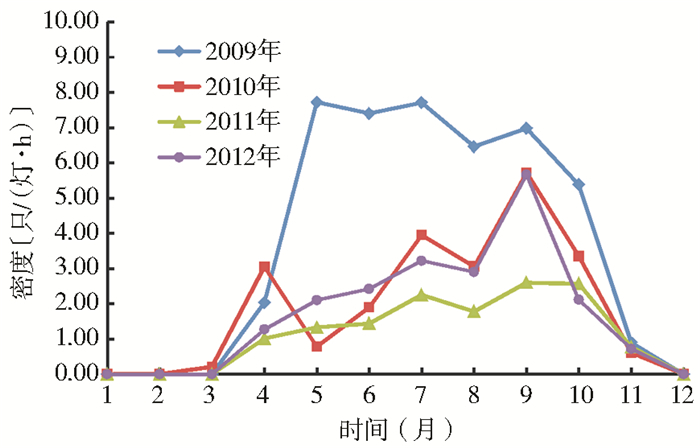 中国媒介生物学及控制杂志, 2011, 22(1): 67-69. 郭文泽, 刘国平, 薛万琦. 虎林林区吸血蠓种组成调查及防治对策[J]. 中华卫生杀虫药械, 2008, 14(5): 380-381. 刘国平, 李东力, 王继群, 等. 我国东北三省吸血蠓的区系分布[J]. 中国媒介生物学及控制杂志, 2004, 15(1): 40-42. 刘增加, 张继军, 宫占威, 等. 青海省双翅目蠓科昆虫研究[J]. 中华卫生杀虫药械, 2008, 14(5): 357-361.